Dizziness is that feeling of lightheadedness. It can also be described as feeling woozy, unsteady, weak, and heavy-headed, like you’re floating or off-balance, potentially leading you to faint. Dizziness is not considered a disease, but rather a symptom of a number of disorders. When your dizziness is accompanied by the sensation of the room spinning around you, this is called vertigo. Research indicates that about 40% of people over 40 will have vertigo at least once in their lifetime. The incidence of dizziness or vertigo increases to around 70% in those ages 65 and older. Vertigo in the elderly is also very common due to the natural breakdown of cells as you age. The prevalence of dizziness and vertigo in the elderly is rapidly increasing. It is so common that dizziness in the elderly is often referred to as a normal age-related phenomenon. Dizziness in the elderly can lead to falling, which is a major cause of accidental death in those older than 65. The causes of dizziness in the elderly may manifest differently since older patients report more non-specific dizziness than younger patients. This means diagnosing vertigo or dizziness in the elderly is far more complex than in younger adults. In general, dizziness is a broad term that describes anything from faintness to a loss of balance. There are many causes of vertigo in the elderly. In fact, the causes of dizziness in the elderly generally may include brittle bones, weaker muscles, vision loss, vascular problems, a new prescription for eyeglasses, and a sedentary lifestyle. Fear or anxiety about death, a change in medication, or medication side effects can also lead to dizziness and an increased risk of falling. The fear of dependence on others and loneliness can sometimes be more frightening than death, and is often especially widespread in the elderly. In times of dizziness or vertigo, older adults may experience confusion and helplessness, which can trigger upsetting memories of past events such as world wars. Causes of dizziness in the elderly can also include benign paroxysmal positional vertigo (BPPV) and other inner-ear problems. BPPV can be due to dislodged calcium crystals in your ear. These crystals become dislodged and affect the vestibular system, which includes parts of the inner ear such as the semicircular canals that contain fluid and hair-like sensors that monitor your head’s movements. These are essential to maintaining balance. Ménière’s disease has often been regarded as a middle-aged disease. It is a rare yet serious inner ear disorder due to fluid accumulation in the inner ear. Dizziness, vertigo, and balance disorders can be the result of major health problems in the elderly. This section will examine the potential causes of dizziness or vertigo in the elderly in detail, including BPPV, orthostatic hypotension, Ménière’s disease, migraines, and more. Dizziness can be the result of changing the position of your head, body, or eyes. Conditions in which dizziness is due to a change in position include BPPV and orthostatic hypotension. One of the most common occurrences of dizziness when lying down, BPPV occurs when you’re stationary but you feel as though the world is moving around you. Inside the labyrinth of your ear—a section of the inner ear responsible for hearing and balance—calcium stones move around freely. In people with BPPV, however, their movement is impeded, resulting in dizziness. A dizzy spell related to BPPV can last anywhere from a few seconds to a couple of minutes, and is common in older people who’ve experienced natural deterioration in the inner ear. It may also happen to young people who may have suffered a head injury. There’s not much you can do to combat this, so simply sit down and wait for it to end before slowly getting up and continuing your day. Orthostatic hypotension is a form of low blood pressure that results when you stand from a lying-down or sitting position. As a result, you will feel lightheaded, dizzy, and maybe even faint. Other symptoms may include weakness, confusion, nausea, and blurry vision. Orthostatic hypotension occurs when something interferes with your body’s natural mechanism for counteracting low blood pressure. Mild orthostatic hypotension may last less than a few minutes. However, long-term orthostatic hypotension can be a sign of a more serious problem. The causes of orthostatic hypotension can include dehydration; nervous system disorders like Parkinson’s disease; endocrine problems like Addison’s disease or thyroid conditions; and heart problems like heart failure, heart attack, heart valve problems, and an extremely low heart rate. A third of older adults also get dizzy after eating a large meal due a reduction in blood pressure. Drugs used to treat heart conditions can also cause dizziness, such as ACE (angiotensin converting enzyme) inhibitors, calcium channel blockers, beta-blockers, diuretics, and angiotensin receptor blockers. The following are a couple of causes of dizziness that are not thought to have any particular cause. Dizziness can be a symptom of Ménière’s disease—a rare and severe disorder that develops as a result of abnormal fluid accumulation in the inner ear, which causes fullness or pressure levels to change within one ear. Ménière’s disease can be sub-classified since the cause can depend on which semicircular canal of the ear is being affected. Fluid can accumulate in either the lateral canal or the posterior canal. In Ménière’s disease, you will have severe vertigo episodes that may last for a few minutes, three to four hours, or up to 24 hours, and are triggered without any apparent cause. Other symptoms will include a loss of balance, anxiety, nausea, vomiting, sweating, headaches, hearing loss, exhaustion, and ringing in your ears (tinnitus). If you experience these Ménière’s disease symptoms, for a proper diagnosis, your doctor will order hearing and balance tests, as well as CT (computerized tomography) and MRI (magnetic resonance imaging) scans, to rule out issues with your brain such as multiple sclerosis or a brain tumor. Migraine-associated vertigo (MAV) is also among the causes of vertigo in the elderly. It is sometimes called migrainous vertigo or vestibular migraine. MAV is dizziness and unsteadiness that comes with a migraine. Acute and severe migraines will also produce a throbbing pain and other symptoms such as sensitivity to light, nausea, motion sickness, imbalance, and a sensation that the room is spinning. According to the Vestibular Disorders Association, about 40% of those with migraines have experienced some type of imbalance or dizziness during a migraine attack. At the time of a migraine, dizziness may also have been present for a few minutes, and up to several weeks or months. Vertigo may be triggered by visual stimuli or a head motion. Symptoms can also occur before, during, or instead of a migraine. Vertigo is also known to be a symptom of a type of migraine variant called Bickerstaff syndrome, which was once called basilar artery migraine. Migraine-related vertigo affects about one percent of the general population, and about two-thirds of those with migraines have a lifelong sensitivity to motion sickness. A person with Ménière’s disease can also experience migraines with dizziness; however, migraine-related vertigo may not be related to Ménière’s if the dizziness lasts more than 24 hours. There are also certain circumstances in which dizziness lasts for days before it gradually improves. This section will focus on the dizziness associated with vestibular neuritis and stroke and transient ischemic attacks. Vestibular neuritis is another common cause of vertigo and dizziness in elderly. The condition is characterized by inflammation of the vestibular or vestibulocochlear nerve—a nerve in your inner ear responsible for sending information to the brain about balance. When it is inflamed, this information fails to communicate properly, and leads you to feel disoriented, off-balance, and dizzy. You will also feel as though the room is spinning. Vestibular neuritis is often confused with a similar condition called labyrinthitis, where there is inflammation in both your vestibular nerve and your cochlear nerve—a nerve that sends the brain information about hearing. Conversely, vestibular neuritis is inflammation of the vestibular nerve only. In addition to vertigo, other symptoms of labyrinthitis include hearing loss and tinnitus. Other symptoms associated with vestibular neuritis include sweating, severe nausea, vomiting, and trouble with concentration. In general, vertigo and dizziness associated with vestibular neuritis will often improve after a few days. That being said, the symptoms can sometimes take about three weeks to disappear. Also, recurring periods of vertigo and dizziness may last up to several months. In most cases, vestibular neuritis is caused by a viral infection such as the flu, measles, rubella, mumps, shingles, chickenpox, or mononucleosis. Although less common, bacterial infections may also cause vestibular neuritis. Dizziness is also a common symptom of a stroke or transient ischemic attack (TIA)—also known as a mini-stroke. Since symptoms of a stroke and TIA are nearly identical, you should immediately seek emergency attention if you experience any of the symptoms. TIA is also often a sign that a stroke may happen in the future. In fact, 40% of those who have had a TIA will also have a stroke. Unlike a stroke, TIA does not kill brain tissue or lead to permanent disability. Besides dizziness, symptoms of TIA or stroke can include trouble speaking, balance issues, confusion, tingling, passing out, an altered state of consciousness, an abnormal sense of smell or taste, weakness or numbness on one side of the face or body, and vision changes like double vision or temporary blindness in one eye. Since people who experience TIA often later suffer from a stroke, early treatment is very important. Treatment options include anticoagulants, antiplatelet drugs, minimally invasive carotid intervention, and surgery to prevent future strokes. High blood pressure, high cholesterol, diabetes, blood clots, and narrow blood vessels are conditions that can block or decrease blood flow to your brain, which can trigger a stroke or TIA. What about when constant dizziness lasts for days, months, or even years? This section will focus on dizziness associated with anxiety, mal de debarquement syndrome, bilateral vestibular failure, and damage to deep brain white matter. Feeling dizzy is among the more disruptive anxiety symptoms. You may also feel woozy, as though you need to sit down. However, lying down or sitting down may not relieve the dizziness. Anxiety-related dizziness has also been called phobic dizziness, psychophysiological dizziness, and chronic subjective dizziness. The person may also fear death or losing control. The most common causes of anxiety include traumatic life experiences; stress; neurotransmitter imbalance; thyroid problems; hormone imbalance; and excessive intake of sugar, caffeine, or alcohol. In general, when anxiety causes dizziness, there is likely no concern, but you may want to pull over if driving. The dizziness also does not mean you have an issue with your brain. When you go on a cruise, your body and brain must get used to the constant motion. This is what keeps you from crashing into a wall every time the ship goes up and down. When you return to shore, it typically takes time to get your legs back. This can take a few minutes, an hour, or up to two days. However, with mal de debarquement syndrome, you still have that feeling that you’re at sea. This is where you are swaying, bobbing, or rocking even though you’re standing still, and there’s no reason for it. You may also stagger and feel unsteady at times. Although it most often happens after being out at sea, it can also happen after riding in trains, planes, and cars. Walking on docks, sleeping in waterbeds, and using virtual reality simulators or elevators can also cause mal de debarquement syndrome. Other symptoms include trouble concentrating, feeling very tired, depression, anxiety, a lack of confidence, and confusion. Symptoms may go away while on a train or car, but they return after you stop moving. Symptoms also worsen as a result of stress, tiredness, flickering lights, being in a closed-in space, remaining still as when going to sleep, and intense visual activity (i.e. playing video games). Mal de debarquement syndrome can happen to anyone, but it is more common in middle-aged women ages 30 to 60. People with migraines may also be more prone to this condition. Bilateral vestibular failure (BVF) is a vestibular disorder in which dizziness is common due to loss of vestibular function in both ears. BVF can occur in any disease where both ears are damaged. Any person who is deaf in both years may have BVF. Sufferers likely had episodes of vertigo in the past, but become consistently off-balance and dizzy at the onset. Other symptoms of BVF include a visual disturbance where objects in the visual field appear to oscillate, blurry vision during head movements, and unsteadiness and imbalance in the dark as well as when walking or standing. For a person with BVF to see clearly, they must stop and hold their head perfectly still. They may also hold their head still with hands on their chin so they can read. Several genetic disorders and some drugs can damage the vestibular part of your inner ear and cause BVF without affecting your hearing. Damage to the deep brain white matter can also lead to dizziness and balance problems. The brain contains both white matter and gray matter; however, white matter damage has been found to correlate with balance problems in older adults. Neuronal fiber tracts run through the deep white matter, and particularly next to lateral ventricles that carry motor signals from parts of the brain important for balance control. A person with white matter disease, in particular, will progressively have susceptibility toward issues with balance and falling. They may also have increasing difficulty with concentration, walking at a normal pace, depression, unusual mood changes, and being able to do more than one thing at a time, such as talking while walking. White matter disease is also sometimes called leukoaraiosis. Risk factors associated with white matter disease include smoking cigarettes, strokes, heart disease, high cholesterol, high blood pressure, and vascular dementia. As mentioned earlier, orthostatic hypotension is a type of low blood pressure that can cause dizziness. We also identified a stroke or mini-stroke as potential heart problems that cause dizziness in elderly. However, other heart problems due to poor circulation that can also cause dizziness include a heart attack; irregular heart rhythms (arrhythmias); a weak, aged, or diseased heart muscle (cardiomyopathy); hardening of the arteries (arteriosclerosis); a leaking or narrow heart valve; or atherosclerosis. Dizziness in the elderly with high blood pressure can also occur. One study published in the journal International Archives of Otorhinolaryngology in 2013 showed an association between hypertension and dizziness. The study had included 493 elderly participants, and 257 of those had complained of dizziness, while 308 reported a diagnosis of arterial systemic hypertension. You may also feel faint, dizzy, or off-balance when the heart does not pump enough blood to the brain. A reduction in blood volume can also cause inadequate blood flow to your inner ear and brain. We’ve noted that dizziness can be caused by a number of brain diseases or conditions, such as a loss or reduction in blood supplied to the brain, migraines, headaches, strokes, mini-strokes, vestibular neuritis, and damage to deep brain white matter. Acoustic neuroma is a non-cancerous growth on the nerve that connects your inner ear to the brain. By disrupting the signal, it can cause a loss of balance, ringing in the ear, hearing loss, and dizziness. Dementia and confusion are also linked with dizziness and a sudden drop in blood pressure. The theory is that dizziness due to low blood pressure may interfere with blood circulation around the brain, and over time, this can lead to dementia. People with vascular dementia also have damaged or lost areas of the brain due to decreased blood flow. There are many medications that cause dizziness. Earlier, we mentioned that drugs used to treat heart conditions and high blood pressure can also cause dizziness, such as calcium channel blockers, beta-blockers, diuretics, ACE (angiotensin converting enzyme) inhibitors, and angiotensin receptor blockers (ARBs). Muscle relaxants, painkillers, antidepressants, antipsychotics, tranquilizers, sedatives, anti-seizure drugs, and medicines that treat erectile dysfunction and Parkinson’s disease can also reduce blood pressure, and therefore lead to dizziness. Dizziness is also a side effect of certain antibiotics such as streptomycin and gentamicin. You can also increase your chance of dizziness when you take some of these drugs while consuming alcohol. Dizziness can happen at any age; however, as featured in this article, there are a number of age-related conditions that can increase your risk of dizziness, and therefore falling. How can getting older increase your risk of dizziness? Many of the age-related diseases mentioned in this article are associated with dizziness, including orthostatic hypotension, arteriosclerosis, dementia, poor coordination and eyesight, hearing loss, and tinnitus. Neuropathy is a progressive nerve disease that is especially common in diabetics and the elderly. In autonomic neuropathy, dizziness and fainting are common due to lack of blood pressure control, which leads to low blood pressure. Also, in menopause, as hormone levels change, they can have an effect on blood vessels and circulation, which leads to dizziness and fluctuation of blood pressure. Other menopause symptoms that can also leave you feeling dizzy include hot flashes, stress, anxiety, or panic attacks. Dizziness can also be caused by metabolic-related disorders, including dehydration, diabetes, low blood oxygen levels (hypoxia), high blood sugar (hyperglycemia), and low blood sugar (hypoglycemia). Hypoglycemia often occurs in diabetics who use insulin. Besides dizziness or lightheadedness, other symptoms may include anxiety, confusion, shakiness, hunger, and excessive sweating. As a result, those with diabetes must check their blood sugar levels quite often. If it drops too low, they may get dizzy. Lightheadedness, dizziness, and weakness are also symptoms of metabolic disorders associated with thyroid diseases, such as hyperthyroidism and hypothyroidism, due to low blood pressure and a reduced heart rate. Addison’s disease is another metabolic disorder that occurs when the body does not produce enough cortisol. When cortisol levels are low, symptoms can include low blood sugar, low blood pressure, dizziness, weakness, lightheadedness, and fatigue. Dizziness can sprout from a diet deficient in certain nutrients, such as magnesium, iron, and vitamin B6 deficiencies. All of these can be reversed by taking supplements; however, you should check with your doctor first. Dizziness can also result from food allergies. Figure out what you’re allergic to, either by keeping a detailed diet diary or by testing different foods and eliminating the ones that are fine. In the end, remove the food that causes the allergy and avoid the dizziness. A lot of people do not replace the fluids they lose daily when they urinate or sweat. This issue is especially problematic in both the elderly and diabetics. With dehydration, blood pressure can drop, and the brain may not get enough oxygen. This can lead to dizziness, tiredness, thirstiness, and dark urine. Dieting can also result in dizziness since certain diets that are low in nutrition lead to dehydration. To avoid dehydration, drink plenty of water and freshly squeezed fruit and vegetable juices. The diet should also contain many anti-inflammatory foods, such as leafy greens, fresh fruit, healthy fats like extra virgin olive oil and coconut oil, and lean protein like grass-fed meat and organic eggs. People with vitamin B12 deficiency can experience a variety of symptoms, including headaches, muscle aches, weakness, anemia, feeling tired or chronic fatigue, difficulty breathing, poor memory, inability to concentrate, and feeling dizzy. Digestive issues like diarrhea, constipation, nausea, heartburn, and cramping are also common vitamin B12 deficiency symptoms. The elderly who have impaired digestion tend to be susceptible to vitamin B12 deficiency. This is because older people often produce less of the stomach acid needed for proper conversion of vitamin B12. Since animal products are often the best sources of vitamin B12, vegetarians and vegans are also at risk of vitamin B12 deficiency. Alcoholics, smokers, and anyone at risk of a digestive disorder are at risk of vitamin B12 deficiency as well. How is dizziness in the elderly diagnosed? The key to diagnosis is the doctor performing a physical examination and taking a thorough history. The doctor will listen to the patient’s story while asking questions related to the dizziness. Do symptoms resolve when the person is still? Does turning the head exacerbate symptoms? Is the dizziness related to changing position quickly? Does the dizziness resolve on its own, or must something be done like lying down? In a physical examination, the doctor will likely take the person’s blood pressure and pulse rate while lying down and standing to help indicate fluid status in the body. Physical examination will also be tailored to the patient’s medical history. As a result, in someone with vertigo, the doctor may focus on a neurological exam that may involve looking at eye movements. The doctor may also check the ears and eyes, observe posture, and perform tests for checking balance. Other common tests that a doctor may order include electrolyte levels, blood sugar tests, kidney function tests, thyroid tests, and a complete blood count (CBC) to screen for an infection or anemia. Depending on the suspected cause, the doctor may also recommend an X-ray, MRI , or CT scan. What can you do about your dizziness? The following are tips for preventing bouts of dizziness and related complications like falling. Use a walker or cane for stability, if necessary. Lie down or sit immediately when you feel dizzy, and rest until dizziness goes away. Do activities that improve balance, such as qigong, tai chi, and yoga. Use handrails when walking down or up the stairs. Install hand grips in showers and bathtubs. Wear walking shoes, low-heeled shoes, or other shoes that have good traction. Until your doctor gives approval, avoid driving or operating heavy machinery when dizziness is frequent. Also avoid heights, such as climbing ladders. Avoid suddenly switching or moving positions. Avoid substances that may trigger dizziness, such as tobacco, alcohol, or caffeine. Consume an anti-inflammatory diet of fruit, vegetables, and lean protein. Drink water and rest in a cool place when dizziness is due to dehydration and overheating. Consume a minimum of eight glasses of water daily. Avoid stressful situations and get seven hours or more of sleep each night. If you suspect dizziness is related to a particular medication, talk to your doctor about reducing the dosage or switching the medication. To prevent falling, remove hazards from your home such as electrical cords, throw rugs, stools, other small pieces of furniture, or floor clutter. Dizziness is quite common, and it will resolve often before seeing your doctor; however, there are times when you should visit your doctor immediately. Make an appointment with your doctor when you have frequent bouts of dizziness. Also, consult your doctor immediately if you experience blurry vision, hearing loss, a high fever, a neck ache, shortness of breath, headaches, a head injury, difficulty speaking, tingling or numbness, loss of consciousness, chest pain, palpitations, droopiness of the mouth or eye, or constant vomiting. These symptoms can be a sign of a more serious health problem, which is why it is best to seek medical attention as soon as you can. Vertigo in the elderly is very common, especially among those 65 years and older. 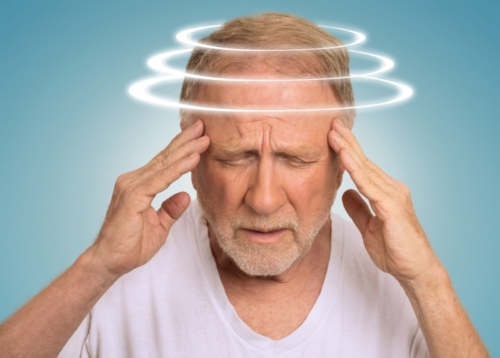 There are many causes of dizziness in elderly, which include benign paroxysmal positional vertigo (BPPV), orthostatic hypotension, Ménière’s disease, migraines, vestibular neuritis, strokes, mini-strokes, anxiety, mal de debarquement syndrome, bilateral vestibular failure, heart and blood pressure problems, brain diseases, metabolic disorders like diabetes, dehydration, vitamin B12 deficiency, and taking certain medications. Once the underlying cause is treated, most of the time, dizziness will clear up on its own. To help manage dizziness and vertigo, it is a good idea to stay hydrated, eat a healthy diet, get enough rest, get physical therapy, and reduce stress. Natural stress relievers include meditation, yoga, exercise, spending time outdoors, and taking warm baths with essential oils. “Why Am I Dizzy?” WebMD; https://www.webmd.com/brain/dizziness-vertigo#1, last accessed April 12, 2018. Pondrom, S., “Vertigo in the Elderly: What Does It Mean?” ENTtoday, October 1, 2006; http://www.enttoday.org/article/vertigo-in-the-elderly-what-does-it-mean/?singlepage=1, last accessed April 12, 2018. Walther, L.E., et al., “Falls and Dizziness in the Elderly,” Otolaryngologia Polska, Nov. to Dec. 2010, 64(6): 354-357, doi: 10.1016/S0030-6657(10)70586-2. Fernandez, L., et al., “Vertigo and Dizziness in the Elderly,” Frontiers in Neurology, June 26, 2015; 6: 144, doi: 10.3389/fneur.2015.00144. “Orthosatic hypotension (postural hypotension),” Mayo Clinic; https://www.mayoclinic.org/diseases-conditions/orthostatic-hypotension/symptoms-causes/syc-20352548, last accessed April 13, 2018. “What IS Orthostatic Hypotension?” WebMD; https://www.webmd.com/heart/what-is-orthostatic-hypotension-dizzy-standing#1, last accessed April 13, 2018. Martel, J., “Meniere’s Disease, Nov. 15, 2015; https://www.healthline.com/health/menieres-disease, last accessed April 13, 2018. Benson, A.G., “Migraine-Associated Vertigo,” Medscape, updated March 9, 2017; https://emedicine.medscape.com/article/884136-overview#a1, last accessed April 13, 2018. Whitman, G.T., et al., “Migraine-associated Dizziness,” Project Muse; https://muse.jhu.edu/chapter/1910030, last accessed April 13, 2018. Konkel, L., “Severe and Acute Migraines: Coping with Vertigo and Nausea,” Healthline, Nov. 28, 2017; https://www.healthline.com/health/migraine/severe-acute-migraines-vertigo-nausea, last accessed April 13, 2018. Belliveau, J., “Signs and Symptoms of Ministroke,” Healthline, May 5, 2016; https://www.healthline.com/health/stroke/signs-symptoms-tia-mini-stroke, last accessed April 13, 2018. Moore, K., et al., “Transient Ischemic Attack (Ministroke),” Healthline, March 31, 2017; https://www.healthline.com/health/transient-ischemic-attack, last accessed April 13, 2018. Whitman, G.T., et al., “Dizziness and Anxiety,” Project Muse; https://muse.jhu.edu/chapter/1910035, last accessed April 13, 2018. “What Is Mal de Debarquement Syndrome?” WebMD; https://www.webmd.com/brain/mal-de-debarquement-syndrome#1, last accessed April 13, 2018. Brandt, T., et al., “Bilateral Vestibular Failure: Causes and Courses,” Oxford Medicine Online, February 2013, doi: 10.1093/med/9780199608997.003.0026. Whitman, G.T., et al., “Dizziness Due to Loss of Vestibular Function in Both Ears,” Project Muse; https://muse.jhu.edu/chapter/1910037, last accessed April 13, 2018. Whitman, G.T., et al., “Small Vessel Ischemic Disease in the Deep White Matter,” Project Muse; https://muse.jhu.edu/chapter/1910038, last accessed April 13, 2018. Wells, D., “White Matter Disease,” Healthline, January 25, 2018; https://www.healthline.com/health/white-matter-disease, last accessed April 13, 2018. Rosario Lopes, A., et al., “Association between complaints of dizziness and hypertension in non-institutionalized elders,” International Archives of Otorhinolaryngology, April 2013; 17(2): 157-162, doi: 10.7162/S1809-97772013000200007. Mundasad, S., “Dementia link to sudden low blood pressure and dizziness,” BBC News, Oct. 12, 2016; http://www.bbc.com/news/health-37618624, last accessed April 13, 2018. Tidy, C., “Peripheral Neuropathy,” Patient, July 30, 2017; https://patient.info/health/peripheral-neuropathy-leaflet, last accessed April 13, 2018. “Dizziness: Living With,” Cleveland Clinic; https://my.clevelandclinic.org/health/diseases/6422-dizziness/living-with, last accessed April 16, 2018.